I have to have something going on in the background, due to tinnitus. Sometimes it’s MP3s of old radio shows. I end up being awake until the wee hours because I get wrapped up in a episode of Dragnet, or Sam Spade. 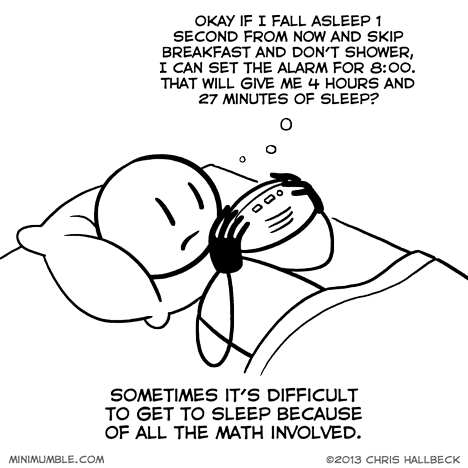 By then, I’m too sleep-deprived to remember I could pause it, and finish it out the next day. I like those shows, too. My favorites include ‘Gunsmoke’ and ‘The Whistler’. 5:01 AM – Workout, shower, breakfast, grooming, leave for work. 6:01 AM – Skip workout. 6:21 AM – Skip shower. 7:01 AM – Skip breakfast. 7:21 AM – Skip grooming, go straight to work.